New exhibition on view at the Canadian Museum of History! Created to mark the 400th anniversary of Samuel de Champlain’s journey up the Ottawa River, this new display focuses on the Aboriginal peoples who inhabited the region long before the coming of Champlain; the journey of the French explorer in the Ottawa Valley in 1613; and the impact of his arrival on the First Peoples. Visitors will see approximately 50 artifacts, some dating from 5,000 years ago, others from the time of Champlain, and afterwards. 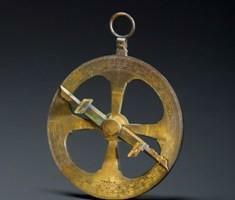 The display includes the astrolabe attributed to the founder of New France.